I hope you had a wonderful Valentine's day whether your valentines are in Heaven or here on earth. (Pictures: Shayla - our valentine here on earth at her Valentine Formal, school dance, last weekend. 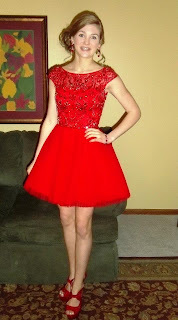 We thought she looked darling in her Sherry Hill dress and Tony Bowls shoes she selected at Henri's in Columbus. Dad insisted she needed the shoes; Shayla and I did not think so, but dad paid the bill so the shoes ended up in the box. ) She had a wonderful time dancing the night away and one of her teachers told me she kept her shoes on the entire evening! This will be the first year Shayla won't be opening presents on her birthday, but she is THRILLED that many kind donations have been arriving for Kids Cancer Crusade. Shayla is looking forward to shopping for a child (or two) with cancer and selecting "just the right things" to bring them joy. She remembers the happiness presents brought Christi and I'm so grateful that she asked to do this in lieu of birthday gifts. She said, I have been incredibly blessed and do not need or want anything; however there are children fighting for their lives who could use a special treat." And she's right! I'm so proud of our sweet daughter! HAPPY 14th BIRTHDAY, SHAYLA! From Shayla: As you may know, I have a birthday coming up next week. If you were planning to get me a gift, may I please share a suggestion? Please consider making a donation to Kids Cancer Crusade instead of buying me a present. I have been incredibly blessed and do not need or want anything; however, there are children fighting for their lives who could use a special treat. Kids Cancer Crusade is a 501(c)(3) non-profit organization started in honor of my sister, Christi, a childhood cancer victim. KCC is a 100% volunteer organization and they work to support families of children with cancer. With any money I may receive for KCC, they will assign me a child (hopefully more) to buy items for and then I will mail the gift box(s) to the child(ren). I remember Christi receiving gifts and surprises throughout her four-year battle and I know it always made her day. I want other children and their families to receive the same joy and help. If you want to help, you can either get your money to me (and I will get it to KCC) or you can send it directly to them at: PO Box 1045, Fremont, OH 43420. Please put a little note inside with my name on it. National Pancake Day - CLICK THERE - In case you can't open this little 35 second video we made, here are some pictures. If you can open the video, I hope you enjoy it! 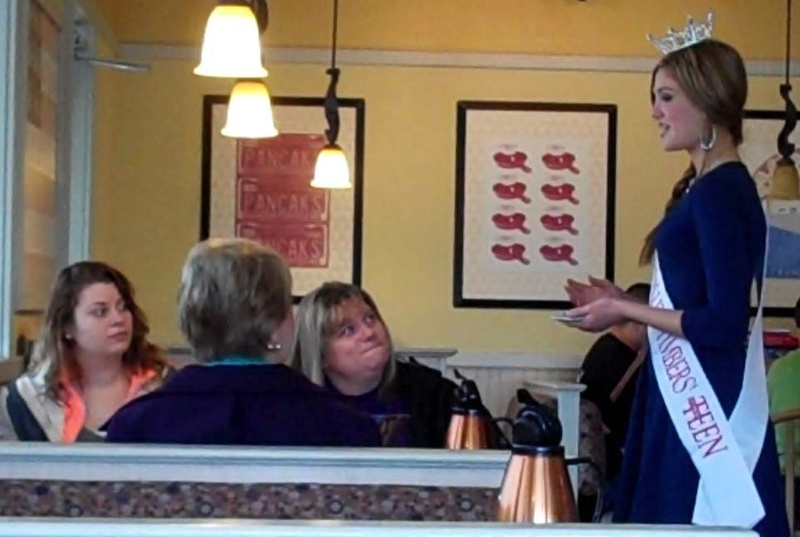 Miss Ohio's Outstanding Teen, Sarah Eash and a sweet IHOP employee we fell in love with, and Shayla Thomas . 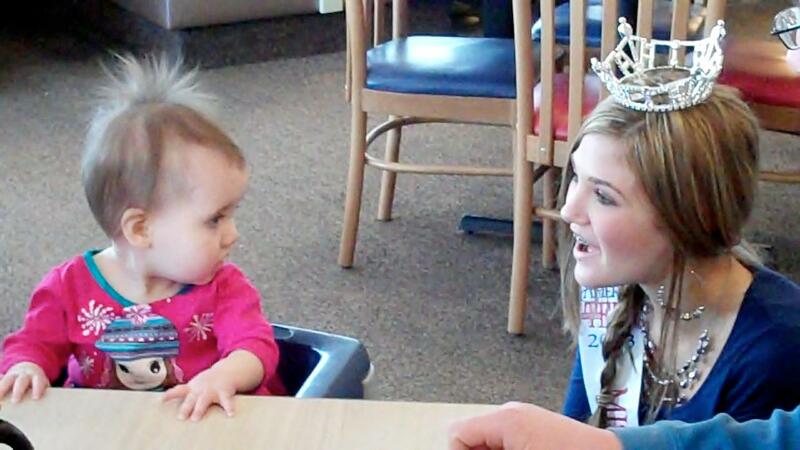 Shayla talking about CMN, the national charity of Miss America. Shayla Thomas promoting CMN and her personal platform of childhood cancer. 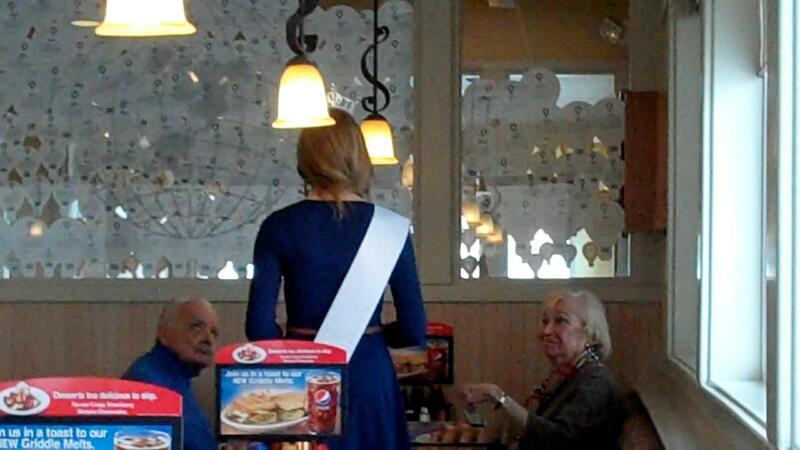 Shayla at IHOP on National Pancake Day (Perrysburg, Ohio location). Over $1,000 was raised for CMN at this location! Thanks, generous donors! Shayla fell in love with this little Miracle Child, too sweet! 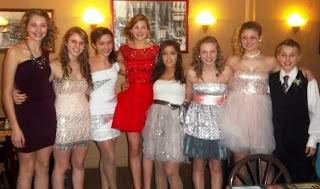 The girl has an amazing gift of gab. She loved walking around and talking with everyone and wasn't shy about promoting CMN, her platform and asking them to consider making a donation to CMN. 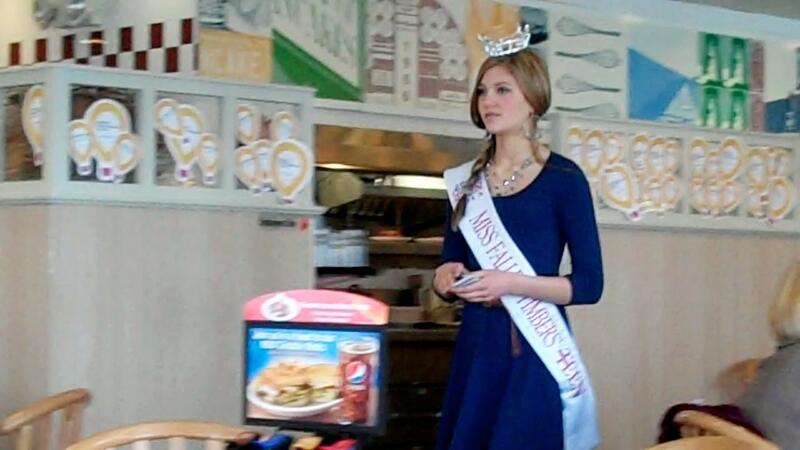 Shayla Thomas loved helping out at the fundraiser for the Children's Miracle Network at IHOP yesterday. 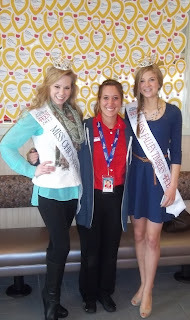 With help from these three title holders, over $1,000 was raised for CMN at this Perrysburg IHOP. (They were trying to help beat last year's nation-wide record of $3 million dollars!) CMN is the official charity of the Miss America organization. Money was collected for Mercy Children's Hospital in Toledo. (Christi treated at two CMN hospitals and with Dr. Jasty at Mercy's in Toledo. 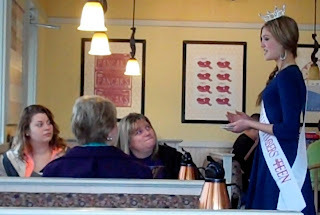 I loved listening to Shayla talk about Christi to the patrons as she promoted CMN. So, so sweet! I know Christi is proud!) Have a great weekend!